Uglyworld #291 - "Jaffa Cakes Are The ONLY Option Available" (12/365), originally uploaded by www.bazpics.com. 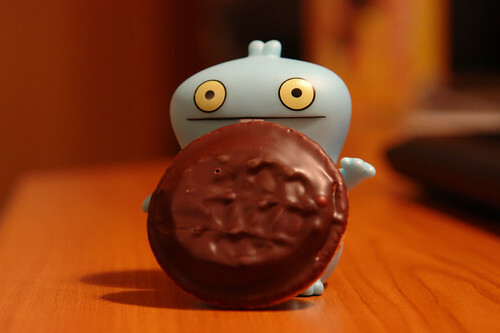 Babo had been listening intently to the discussions in the previous days about why Wage should neglect the beer in favour of Jaffa Cakes, and decided to chirp in last night with his own view. "Personally, and I can say this unequivocally - Jaffa Cakes are the ONLY option available to you Wage, they are simply exquisite". Babo has been reading some books of late, and quite dramatically his use of large words in sentences seems to have improved ten fold.